Please, tell us a little bit about your first encounter with wine & the wine industry? I am from Malaysia and have been working here in Singapore for more than 10 years now in different establishments. Currently I am Assistant Manager & Certified Sommelier at Senso Ristorante & Bar Singapore. My first encounter and introduction to wine was in 2005 when I was working in the bar as Junior Bartender at Prego Ristorante, Fairmont Hotel Singapore. My duty was to make cocktails, coffees and also deliver wines from the shelves when ordered by the floor staff. I loved to make cocktails especially when I can make my own concoction and from then, that is where I have the chance to taste the wine and use some for the concoction especially in Shangri-La. Any particular mentors at that time? I could still remember one very particular mentor who has mentored me. He was Mr. Sam Teoh, who was my Wine Captain and he has been in the Food and Beverage Hospitality industries for quite some time now. There was a time when he gave me a glass of Amarone della Valpolicella in which he tried to test and explained to me on how to appreciate the wine from the glass by tasting. From there, I realized that wine was like a baby that always has a vintage taste and has to be carried with class. Once the bottle is opened, it has to be decanted in a way that is careful without disturbing any sediment. This has captivated me and therefore I took that opportunity to learn and explore more about wines. There is one person I admired and he is currently my working colleague, Mr Nejib Gara. He is my Head Sommelier at Senso Ristorante & Bar Singapore. He is 63 years of age and has been delivering the wine service professionally with full of patience explaining to every guests, from table to table the beautiful story of Wines. For a man that age, he sure does have a superb memory. He remembers most of our guests and the kind of drinks they prefer when dining in at the restaurant. At times, he would make special arrangements, recommending the right wines for the right occasion. Importantly, he makes our guests feels welcome and no doubt they will always come back for more. That itself to me is what a true Sommelier should possess as a profession. Well, my advice to the young Sommelier or Commis Sommelier is that you need to have the love and passion for wines as every wine has it’s own uniqueness that represents each qualities. Every bottle and taste has it’s own story. With that, you can understand the basic terroir in which grapes are grown that gives each wine its unique flavor and aroma, tasting evaluation, sequence of service so you can build a strong foundation with that knowledge. He/she needs to be ready with full confidence when serving wines and always be prepared to answer any questions by the guests. There is a saying “Share your knowledge. It is a way to achieve immortality”. Nevertheless, it is always better to start at home to gain that knowledge. Only then it would would be wiser to expand it abroad, if permissible. In my opinion, firstly we need to know the guests’ preference before giving options. Their preference in the texture and quality of the wine, be it sweet, coarse, light or a full body kind of wine. Then secondly, the occasion. Each occasion plays a big part in having the right selection for that perfect wine. I would definitely recommend the Schott Zwiesel brand as it is The World’s Most Finest Crystal wines. Traditionally, it is known that Red wine goes perfectly with red meat whereas the White wine goes with white meat. No doubt, without any obligation I would always encourage my guests to be a little daring to try something new to suit that special occasion. It is definitely not advisable unless it is requested by the guest. Where would you suggest a young Sommelier start searching for Sommelier positions on the internet in your country? 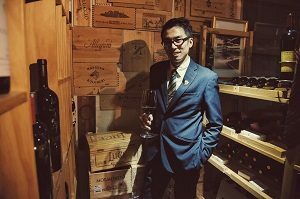 Here in Singapore, either a French or an Italian restaurant would be a good start as they have a more wider selections of the perfect and vintage wines. Here are some good places to start with; Les Amis, Jaan, Saint Pierre, Andre or Joel Robuchon for French cuisine or perhaps at Senso, Dolce Vita, Osteria Mozza, Garibaldi, Otto, Amarone or Basilico for Italian cuisine. The key ingredients are to consider the concepts of the restaurant, the menu design, all the clientele and as well as to be well trained with the associates so as to be able to sell the wines. My opinion to maintains that there is a magic number where a good sommelier can do lower markup, sell more wine and make the same amount of profits. Industry-wide markups average two and a half to three times whole sales cost. For the price on wine in the restaurant have to be appropriately and value for the quality. Usually there would be some media publicity from Wine Press or Magazines. It is advisable to get the marketeers to find some well known artist or brands to tie up with some event launches. I would [refer to be made from the very fine Nerello Mascalese and Nerello Cappuccio as they are from the low yielding vineyard. It is a distinguished wine with fresh, fragrant, beautiful slender and fine grip even as it aged, it still weave gathers into a rich complexity. Wine Spectator Magazine, Wine & Dine Magazine , The World’s Fine Wine Magazine.